Operation Big Bull: ‘Botched Rescue’ led to death of bull? 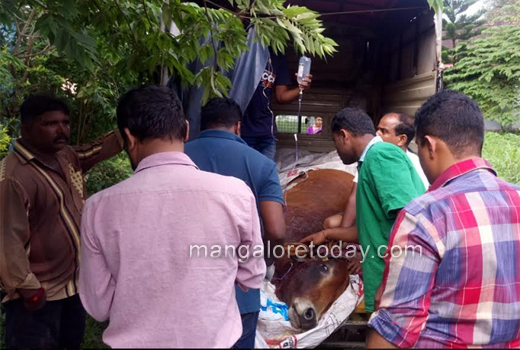 Mangaluru, September 07, 2018: The story of the stray bull of Panambur with a huge tumour on its head came to a sad end with the bull reportedly dying in a botched rescue operation undertaken by the state Animal Husbandry department on Wednesday. According to reports, the Animal Husbandry department had made a final attempt to capture the elusive bull in the wee hours of the morning and succeeded in manually administering sedative while it was sleeping. When the bull continued to struggle, they tried to hold it down with ropes. 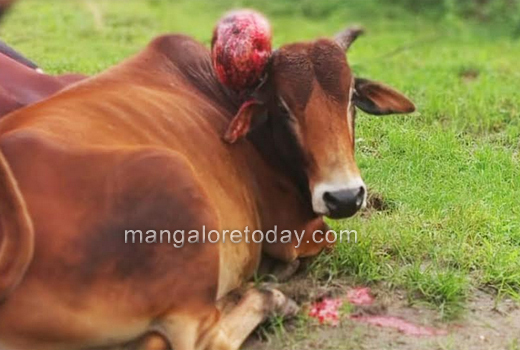 In the process, it smashed it head against a pillar when its tumour burst and began to bleed. The animal was then subdued and taken to the veterinary poly clinic on Jail Road, where it finally succumbed to its ordeal. 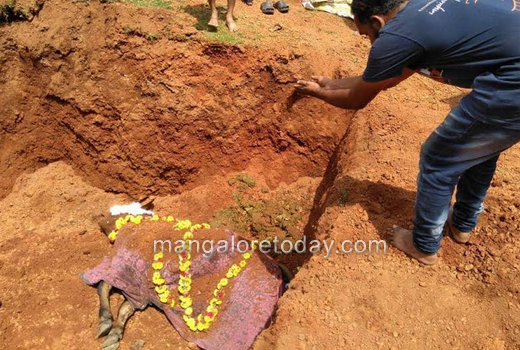 It was subsequently taken to a cow shelter at Pajir and buried after conducting post mortem. 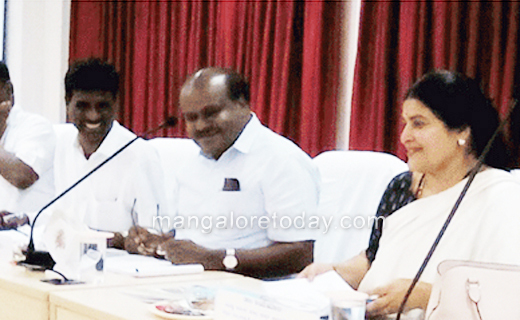 During post mortem over 15 kilos of junk items like plastic, ropes and metal wires were found. The official cause of death is ‘respiratory failure’. But there are contradictory reports which claim that the bull actually died to due to excessive bleeding as the rescue operation was poorly planned and the veterinary team did not even have the basic requirements for dealing with such eventuality. The bull which is said have suffered from cancer of the horn had elicited much curiosity and sympathy from the public. Posts concerning its pitiable condition were being widely shared in social media. It was estimated to be about 10 years old, the normal lifespan being about 15 years. 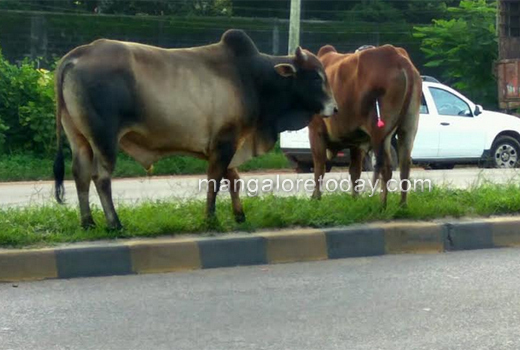 After the bull starting making news the Animal Husbandry department had written to the Deputy Commissioner of the district on Monday seeking permission to form a committee to capture the animal and provide it with treatment. On Tuesday morning an attempt to sedate the beast using tranquilizer darts failed. Though the dart hit the target, the dosage of the sedative proved to be insufficient. When the situation threatened to get out of hand, the mission was abandoned. On Wednesday morning when some locals spotted the bull sleeping in an easily accessible position, they alerted the department officials. In response, the officials rushed to the spot with four veterinarians in attendance. This time they were able to get close enough to the animal to administer the sedative manually. Things went horribly wrong after this and eventually resulted in the animal’s death within a matter of a few hours. Dr. Mohan Reddy, Deputy Director of the Animal Husbandry department, is very clinical in his explanation for the unforeseen outcome of the rescue operation. “The bull eventually died of respiratory failure. It was born and brought up in an industrial area and it had been exposed to all sorts of human activities. 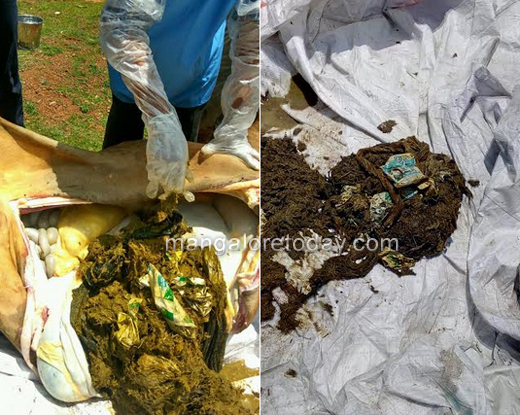 During post mortem we found that much of the contents of its stomach were foreign objects like plastic, ropes, wires and Nandini milk pouches. Its lungs had developed fibrosis, which is an irreversible disease, and it also had carcinoma. Both vets agree that with its given critical health condition, it would not have lived long. 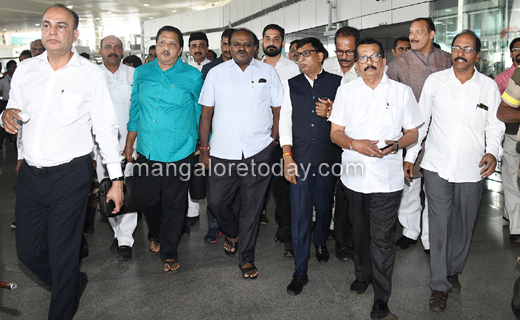 As for the tumour burst during its capture, Dr. Mohan Reddy says though the scenario it might look shocking, it is nothing serious to worry about. It’s the animal’s underlying health condition which is really to blame for its death. News of the death of the bull came as a surprise to all. While Animal Care Trust (ACT) curtly acknowledged in its Facebook post that Animal Husbandry department had taken up the matter, its Rescue In-charge Tauseef Ahmed wrote on his FB wall that he was heartbroken by the death of the bull. “We were neither informed nor involved in the process so the regret is even more horrible,” he wrote indicating a sense of hurt that they had been kept in the dark. The NGO which had been following the case of the bull last few months also deflected any enquiries saying they were unaware of any further developments. Animal lovers of the city were visibly angry and skeptical, with some even suspecting that the department only wanted to get rid of the bull because it was drawing a lot of negative publicity. Many animal lovers took to Facebook to grieve. Some felt that death could have been averted. “The utter failure was because of lack of planning. Catch the bull dead or alive seems to have been the motive from the beginning,” said one. Animal lovers are known to be sensitive in their approach to the creatures. It would be too much for anyone to expect the same talent and extraordinary commitment from appointed officials. Distrust of the government apparatus is also commonplace across Indian society. Government system, by its very nature, suffers from a great many restrictions and limitations. Public-private partnership (PPP) had come as a solution to overcome some the lacunae of the government sector. At Government Wenlock Hospital for example, the PPP model, which involves active engagement with NGOs and voluntary organizations, has led to huge tangible benefits for the patients and improved healthcare indices. Animal Husbandry department could consider adopting similar strategies to increase its success rate in the future. The department may not be entirely at fault as is made out to be. They might have simply followed the rule book. And as the eminent vets say, the bull may really have not had long to live anyway. But the way in which it went could have been better.